On the south-eastern coast of Australia, surrounding the beautiful city of Melbourne, the State of Victoria boasts numerous quality wine regions, perhaps best known today for some of the top Pinot Noir and Chardonnay terroirs. There’s pressure on all of these vineyards from the burgeoning city and developers looking to expand into the suburban areas around, but there’s pressure from a potentially more worrying source too: Phylloxera. It took me a couple of visits, wondering why I was not being shown around vineyards but only wineries, to realise that Victoria’s winemakers (and those in other regions) are currently in something of a state of lock-down. That’s to prevent the spread of the dreaded Phylloxera louse which has recently reared its ugly head in significant parts of the state. Entering vineyards is discouraged, and is tolerated only after boots and equipment have been thoroughly disinfected. The movement of workers and machines between vineyards is also being carefully controlled. It might come as a surprise to learn that much of Australia’s vineyard is planted on its own roots, not on the resistant American rootstock so prevalent around the world as the first line of defence against Phylloxera. In a region like Geelong, for example, vines are invariably planted on their own roots, so the bio-security measures that are in place are taken very seriously indeed. Still, there are many in the industry who say infestation is inevitable, and some are already digging deep to re-plant on rootstocks before the doomsday scenario becomes reality. That translates into what one of the other winemakers present at the group tasting I attended describes as “Quite an ad-hoc dry wine industry,” explaining that there are all sorts of little pockets of things planted, suited to the local soil and climate, but also the needs of the city’s bars, restaurants and consumers. Yarra’s modern foundations were built on sparkling wines, but the grape harvest dates today are more than a month later than they were twenty years ago. Whether this is caused by climate change or not, it means that dry wines are now also the region’s forte, particularly Pinot Noir and Chardonnay (a lot of it originally planted for sparkling base). Gamay is seen as a potentially important alternative variety and plantings are growing, though from a very small base. Yarra is also the traditional home of some excellent Cabernet Sauvignon wines too, though it’s a tougher sell than Pinot today, and in this particular tasting I found Syrah also showed very strongly. (2017) One percent Viognier in the blend and from five-year-old vines. Young, juicy Shiraz, with buoyant plum and cherry fruit brightness. Spice and a tight, a hint of liquorice concentration. The palate is very firm, tight and juicy, with a cheryy skin bite of tart freshness, with a touch of iodine and graphite character, a real edgy intensity. An interesting one for the future. Very tight, very keenly juicy, but closed with not a lot of aromatics. The palate has a load of dry tannin, a tight, grippy but fine structure, but that dark fruit and fruit skin intensity powers through with bittersweet concentration. Again, this needs time. (2017) A slightly more open, meaty and lightly herbal-fragrant character, much more aromatic. The palate has delicious creaminess and a sweet blue-black fruit intensity and cherry fruit flesh ripeness. A lovely bloody streaked style of Syrah with delicious spice and plumpness. (2017) 75% whole bunches were used here and the nose is tight, ashy with a touch of herbal and lightly earthy character, in a nice cool climate Syrah style. Tight, juicy palate, lots of cherry flesh and skins, chunky tannins warmed by some more mellow oak, good acidity and tight and deliciously lip-smacking. Note price and stockist at time of review is for the 2014 vintage. Carodus is a very small production and a barrel selection from the oldest vineyards at Yarra Yering. The Shiraz comes from ancient bush vines, all made in one ton fermenters. Beautiful coffee and dark, fleshy plum, loads of exotic spice giving clove, violet and tobacco, delicious and retains great freshness, Is there a touch of Viognier here? On the palate It's a multi-layered wine effortless blending richness and agility into a cool, long finish of lean acidity and tight, supple tannins. A real stand out wine this. (2017) 30% whole bunch. Again touches of pepper and greener, cooler climate aromatics, a touch musky. Deliciously mouth-filling, with soft tannins and a creaminess, elegant fleshy red fruits, then tightening to black fruit and spice.a touch of ferrous quality into the finish. A very pleasing, creamy wine with good freshness too. (2017) A rare still wine made from Champagne's Pinot Meuinier, 100% whole berries fermented and aged in puncheons. Pale, perhaps slightly barnyardy, leafy aromas, with light spice and earthiness, the plum flesh and brighter raspberry fruit, the palate light and super fresh, with a hint of strawberry sweetness, a little coffeeish softness coming though for easy drinkability. Firm and juicy, the touch of tight briar and leafy character, but stays fresh and tight, only old oak used. The 20% Gamay adds a dry tannin and a delicate cherry freshness, finishing with a bit of roughening tannin and a clean acidity. Price and stockist quoted at time of review is for the 2015 vintage. (2017) I get the idea of this natural blend of Gamay and 25% Cab Franc from Tom Belford, such a pale colour that it is almost rosé, but for me it is not entirely successful. Whole bunches were fermented in very shallow fermenters with no sulphur and wild yeast. It has a mousiness, a very funky and rather too elastoplast/bretty character for me, certainly it is medicinal. Pale and juicy on the palate, it is cleaner, and that slightly yeasty/wheat beer character was interesting. I grew to like this more as I was tasting it: not completely successful for me, but surely interesting. (2017) Really nice, expressive Barbera, with a creamy but shiny cherry skin and plum skin tang and brightness. The palate has a beautiful fruit freshness and purity, and intensity and lots of fleshy red berries, tinged with spice and tobacco into the finish. Juicy and delicious. (2017) Several Portuguese varieties here including Touriga Nacional, Tinta Cão,Tinta Roriz and Sousão. Buoyant, fresh and approachable, it's juicy with little floral hints, a touch Bojo in style perhaps, with a big fruity and spicy palate, loads of dry tannin and red fruit skins bite. (2017) Relatively old vines. A touch of leafiness and earthiness to this, joining in with the cool black fruit. There's a dry woody note too, the 30% new barrel a little prominent in a slightly sawdust spectrum. Lots of blackcurrant juiciness but tart dry acids too, creamy but grippy tannin, and a nice plum-skin grip. (2017) Named after Mac's dad, there's a rich touch of Agen prune and currant to this Bordeaux blend, cedar and spice and then a fresher, more vital black fruit ripe freshness. The palate has really nice balance, the fruit savoury, the structure nicely fresh and firm, giving this very good length with a lovely classic style. (2017) A much bigger, mintier nose, with touches of eucalyptus and chocolate, then plenty of fudge and tight, grippy black fruit. The grip of fruit skins and tightness on the palate, more old school in a way, but does not suffer from that - a terrific wine. Price quoted is approximate at time of writing. (2017) 100% whole bunch Caberenet ("are you crazy"? Mac Forbes), cork and wax capsule. Only matured in older hogsheads. Has a nice stemmy lift and light earthiness and gaminess, has lots of light and shade with realy deep blue/black fruit felshiness. Delightfully sweet on the palate, a really generous spirit to this, plump and juicy, the energy of the tight, cherry-fresh acidity and creamy tight tannins. Very different, very marvellous. (2017) A bit of age on this single vineyard wine, from a vineyard with a bit of altitude at 230 metres. A nice classic style, with cedar and graphite and an intense blackcurrant fruit. A nice chalky softness to the tannin structure here, sweet and gentle acids too, that and the creamy oak wrapping round pure black fruit. Very elegant, pure and ripe. Whilst in Yarra I had the opportunity to visit one of its most historic and renowned estates, Yeringberg. 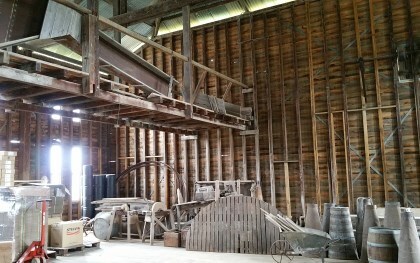 Founded in 1850, Yeringberg is one of the original Yarra wine farms. It remains in the same family hands, and I met up with Guill de Pury, grandson of the founder, and his daughter and now winemaker, Sandra (right). We toured their fascinating 1885 winery, a national treasure and surely the cutting edge of winery design in its day with a small ‘train’ that runs on rails in the rafters, depositing grapes into casks below, in an entirely gravity-flow mechanism (there’s a very similar system in Louis Latour’s historic Château de Grancey in Burgundy). Back in the 19th century, 60 acres of vines were planted, the market largely being exports to the UK which still had a shortage of wine due to Phylloxera in Europe. By 1921 the English market had dried up, and Yeringberg was the last to abandon wine growing in the valley, converting to sheep and cattle farming. That continued until 1969, when several Yarra families determined to revive the industry, so Yeringberg planted small amounts of grapes again. Today they make wine from only a tiny three hectare block (though grow grapes for other concerns). Pinned to the old cellar doors is a marvelous collection of wine show certificates dating back 100 years, many of them for wines made from Marsanne, which is still grown in tiny quantities though superseded by mostly Bordeaux varieties today. It’s an iconic label, regarded with huge affection, and producing some of the region’s very best wines in tiny quantities. Sadly that means they are also difficult to source, the top wines rarely seen on the market as they are snapped up on allocation by regular buyers. (2017) Fermented in steel and aged in old casks, with no malo and no stirring. Vines from the 1970s. A field blend of the two varieties that is a little bit leafy, light and green herb scented, cool apple fruit, very restrained. Crisp and juicy on the palate it just hints at peachier weight but stays fresh, with lots of dry, apple core acidity and tightness. Long and juicy. (2017) Three percent Viognier in this helps give a lovely white pepper lift, lots of cool, elegant lightly green notes and pert red and black berry fruits. The palate has a lean streak of acid and tannin, grippy in the finish with good fruit weight but a tight structure and a savoury, gravelly finish suggesting decent ageability. (2017) Last vintage made before Guill pulled the original Shiraz out. Big, rather animal nose, the fruit dense beneath. The fruit on the palate has a chocolate richness still, a fine and dense plum flesh and great sweetness, silky and smooth, with a meaty richness. A lovely old wine once past that slightly animal (bretty?) nose. (2017) Beautiful nose, from a field blend Guill planted to exactly the same proportions of his favourite wine, Haut-Brion. Such a superbly elegant nose, with graphite and tobacco, 22 months in oak, up to 40% new, giving a hint of vanilla, and the fruit so intense yet elegantly lifted and ripe. Creamy and so refined on the palate, it has terrific fruit elegance, so fine, touched with delicate floral and kirsch-like touches, and rounding into a sweet finish, so subtly supported by the structure. Just superb and built to last. (2017) Just a touch of game, the pure, essential black fruit giving way just very slightly to those tertiary aromas and flavours, but tight as a drum. There's a floral and kirsch purity to the fruit, a rich fleshy quality, still glossy, but the structure is fine, firm and will need time as this is only just loosening up. (2017) Browning rim. Gamy on the nose, lots of developed aroma, lots of smokiness and fudge, a bit of leather and truffle, some barnyardy character but the whole picture complex and layered. The palate is still plush and glossy with fruit purity, a hint of currant, but more about plump and still juicy and youthful blackberry, then the spice and the sweetness goes on. Lying so close to Melbourne, Mornington was always a popular destination for city dwellers, but even as late as the 1970s it was not considered for vine growing because of its cool climate. Soils here are on a basalt base from ancient volcanic events, becoming increasingly sandy towards the tip of the peninsula where viticulture peters out. There’s plenty of rainfall in one of Victoria’s most maritime regions, though no great altitude with vineyards running to 300 metres. Ocean breezes are influential and undulating hills give different aspects, and suitability for different varieties to be grown. 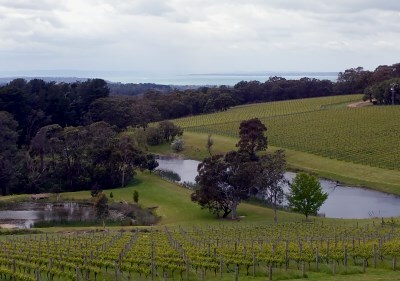 Above: the vineyards of Kooyong/Port Phillip Estate looking towards the Bass Strait. It’s a region that is “getting a lot smarter with water,” in common with other Australian wine areas, one aspect of which is increasing organic matter in vineyards and not having bare earth between rows: doing so by just 1% can save 100,000 litres of water per hectare, per year, I was told. Winemakers present at a masterclass I attended gave a run-down on recent vintages: 2013 a great vintage; 2014 a very good vintage, especially for Chardonnay; 2015 a great vintage, possibly the best ever for Pinot Noir. (2017) Prevaling easterly wind helps cool this vineyard, planted in 1981 mostly as Cabernet, but since grafted to Pinot and Chardonnay. This is the premium Chardonnay in the range. Rollo Crittenden says he "dabbled with biodynamics but decided against," so now lots of cover crops - legumes and broad beans - and composting, so basically organic with no synthetic chemicals used. Lovely sheen of almond and oatmeal, just the merest hint of flintiness and definite creaminess of aroma. Lovely palate, the lime and orange zest of the acidity also edges the more tropical fruit. Nice firmness to the acids against the creamy texture, a cool apple core bite. (2017) Green-flecked and lightly flinty, but again it is more about that creamed crushed almond character, a bit of citrus peel too. The palate has a really cool freshness, a nicely slippery texture and then a touch of creamy oak to support as precise lime-skin acidity pushes through, just hints of tropical sweetness to balance. (2017) Kooyong is part of the Port Philip stable, winemaker Glen Hayley explaining its vineyards are in a warmer spot that is one of the first as you approach from Melbourne, and very good for Pinot too. Lots of reductive, flinty character, slate and gunflint. Only around 10% sees oak, with no malolactic and the lees not stirred. Such a different style from the Crittenden, with its own more austere charms, touches of green herbs and cool, pithy citrus. Lovely bite of Chablis-like flavour with ramped up intensity. Farmed "more or less," organically. (2017) Seems far less reductive in style than the 2012, more of a nicely rolling phenolic character over ripe orchard fruits. There's lots of fat lime fruit, but taut acids too, the zip and freshness of citrus, just a lovely texture, sweet edged and flirting with exotic, but the whole thing kept beautifully taut thanks to the cool, clear acidity. (2017) Winemaker Mike Symons worked at Antinori in Italy for several years, so perhaps brings a different perspective to his wines. This 2011 shows a little more age and comes from "a very rainy vintage that required four pickings, the first three just to remove rotten bunches." Partial malolactic from these 1988 vineyards planted to Lyre trellising, that are generally more ripe. A nicely and lightly toffeed nose, the palate sherbetty and bright, still drinks nicely. (2017) Quite a minty nose and with a lovely lemon meringue pie quality, creamy but also fat lemons. Very cool, very lean in the mouth at this stage, lots of apple cores and dry pithy acidity, a real intensity and finesse to this, a bone-dry style, the oak just savoury and grippy with no oaky flavours. Long, taut and needs time. (2017) Winemaker Jonathon Mattick explains that the Wallis vineyard was planted in 1992 on volcanic soils, the breeze from the Bass Strait only 4km away being a big influence. This sees 20% new oak with batonnage. Hints of green fig and a bit of slaty/flinty character and a fair bit of oak showing. The palate has a pithy, limey citrus character, with a deal of juiciness that is deliciously mouth-watering. (2017) More creamy and gently toasty oak, with more of that complex fig and gentle sulphidic character, nicely hazelnutty, with plenty of citrus and crunchy apple acids, with a ripe lemony fruit - sharp, but with fat and generosity, with the oak filling in. A more diffuse style than Kooyong for example, but very delicious. Note price and stockist at time of review are for the 2014 vintage. 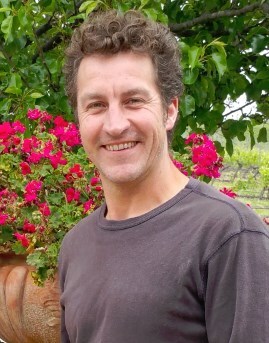 (2017) Winemaker Luke Lomax says the philosophy is to look for balance between fruit, acid and phenolics and always lower alcohols. Crushed and fermented with wild yeast in 500l puncheons, no malo. Quite creamy and appley, the light earthinss and straw-like notes of wild yeast complexity, lime rind and a touch of spice. The palate shows lovely nuttiness and a bit of breadth of texture, but that taut mineral and lemon/apple dry acid and keenly juicy fruit concentration gives great clarity. Note price and stockist shown at time of review is for the 2014 vintage. (2017) Nice flinty character here, very appealing, though quite closed, feels just a little constrained and as though there's a lot still to come in a true baby of a wine. Very nice balance, very nice tight citrus zest and hints of that flinty mineral saltiness, suggest this will evolve very nicely and I am confident it will deserve its score. Price and stockist quoted at time of review is for the 2014 vintage. Following this Chardonnay masterclass, a series of other Mornington Peninsula wines were served before and during a particularly good lunch at Port Phillips’ on-site restaurant. (2017) Nice hint of flintiness and real brightness to this all-Chardonnay sparkling wine, the palate has a lovely ripe lemon fatness, but stays fresh and crisp, fruit ripe and sweet without a huge amount of autolytic character. (2017) From the southernmost winery on the Peninsula. Cuttings from Kathleen Quealy, queen of Pinot Gris. Fresh and limpid style, lightly creamy from oatmeal and almond barrel, arguably a touch too much has a fine apple skin with a fine texture. Very attractive, lemon sorbet character, it has fine texture, largely dry, acidity very good. 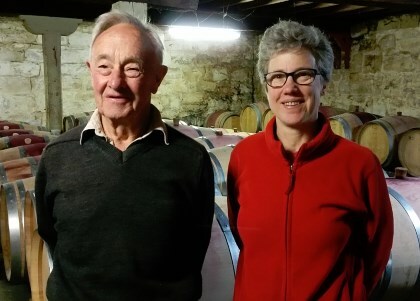 (2017) Pioneers of Pinot Gris in Australia in the early 1990s, planting in Wogga Wogga where owner Kathy Quealy studied oenology inspired her. She says "Pinot Gris is just like Pinot Noir - it's very site specific and needs a cool climate. 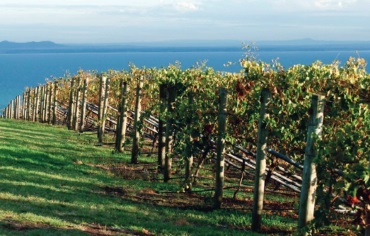 Mornington Pinot Gris is in huge demand in Australia." Much more leesy and aromatic than the Nazaary, more weight and texture on the palate. There is some balancing sweetness in a generous Alsace style. (2017) Emerald tinge to the colour, nice hint of butter and toast from the barrels, a nice hint of flint too, however, and turns quite tight and retains plenty of fruit sweetness against its acidity. Rather nice. (2017) Middle tier of the range, whole bunch fermented, partly with wild yeast, no malolcactic and 20% of new barrels. Creamy and a little restrained, a touch of almond and fat lemon and then lean and savoury onto the palate, but has lovely cream and sweet apple flesh fruitiness. Tight finish, long and poised. Note stockist and price at time of review is for a different vintage. (2017) Meaty and herbal, with tobacco and ripe fruit, but quite evolved with a brown sugar and a bloody streak, a deal of complexity and interest here without a doubt. On the palate there is a suppleness and firmness that extends the wine in the mouth, though all the time wrapped in those nicely funky, properly Pinot characters and sweet fruit. Note price and stockist quoted at time of review is for a different vintage. (2017) Fragrant, delicately floral and vegetal, crunchy twigs and briar in the complex and attractive profile. On the palate a delicate creaminess of fruit and texture, but stays gentle and rose-hip scented and feminine, lovely warming hint of coffee and spice in the finish. (2017) Beautifully fragrant oak (all French barriques). A touch of vivid floral character, soft incense spice, open elegant and fruit driven on the palate, with really good acidity and a tight, tight tannin structure. Yet another different, and equally fine expression of Mornington Pinot. Price and stockist quoted at time of review is for a different vintage. (2017) Very pure fruit, a really intense aroma of red berries and a hint of ashy lift and liquorice. The palate has sheer, silky fruit, plush but fresh and medium bodied, such sweet and pure fruit into a long, elegant, but powerfully concentrated finish. A huge contrast to the Ten Minutes, concentrated, plush, but equally delicious. Price and stockist quoted at time of review is for the 2014 vintage. Sitting just across the bay from the Mornington Peninsula, Geelong was one if the first regions planted In Victoria in the 1850s. By 1895 the first great wave of Phylloxera had destroyed the industry, and no new vines were planted until the 1960s. Sixty years of good quarantine means the majority of vines are today planted on their own roots. It is a big region, further divided into the Bellarine Peninsula, Moorabool Valley and Surf Coast, with around 60 wineries and 150 vineyards. Bellarine is an interesting terroir, largely composed of black basalt soil over limestone, though the soils of the volcanic Moorabool Valley are not dissimilar. On the Surf Coast sandy soils predominate, on a coast exposed to often rugged Bass Strait weather. The area’s reputation is built on Shiraz, Pinot Noir and Chardonnay, but is also a happy hunting ground for a host of alternative varieties, from Primitivo to Gamay and from Lagrein to Monduese. Classified as a cool climate area, vineyards run to around 400 metres above sea level, with temperatures moderated by its coast. (2017) Nice, creamy, but brightly fruity Pinot Gris, plenty of lemon zest and firm pithy acids, a taut and juicy character, touches of herbs and saltiness in a fine, dry but gently creamy style. (2017) Wild ferment, one thirds each fermented in puncheons, tank and tank on skins. Aromatically subdued, but a delicious nuttiness and apple skins. The palate has lovely textural richness, great length and a delicious orange acidity. In many ways un-Sauvignon-like, but complex and rather delicious. (2017) Lovely nose of creaminess and almond paste smooth nuttiness. The palate beautifully rounded, with super-sweet fruit that's cool and minty though with hints of topicality, a lovely texture and great balancing acidity that stays juicy like sweet apples. (2017) Sandy vineyard. Real lift and exoticism, a perfume and exotic ginger and a touch of passion fruit. Great personality on the palate too, but a raft of apple fresh acidity cutting the creaminess of the texture. (2017) Fifteen months in French oak barriques, half new, and lovely flinty reductive notes adding lots of complexity. Comes through with a fat, full texture and creaminess, very nice apple fruit and that elegant, creamy complexity. (2017) Very cool and a touch flinty, and a delightful biscuit richness but turns so racy and tight, a really poised mineral acid thrust to the long, elegantly tapering finish. (2017) Well, Savoie France is the spiritual home of Mondeuse, but as so few of them ever find their way onto retailer shelves outside of the area, how fascinating to find an Aussie version - and it's a good one. Fabulous inky clove like medicinal stuff, high cherry aromatics tight, earthy and deliciously tangy, higher acid style. (2017) Picked earlier than many then nine months in older oak. lovely sweet cherry and rose nose, touches of briar and sweet dried cherry. Soft, straightforward and elegant, but there is spice and a fine tannin structure in a style I really enjoy. (2017) A tighter aromatic, a slightly stemmy character, with the palate exploding with fruitiness and chestnut and briar. Long, rounder and richer in style, but another lovely Pinot. (2017) A more Burgundian character, with cedar and chestnut, a little truffle and cream, dry red fruits. The palate is sappy, briary and delicious, still following the Burgundian line. (2017) A nice bit of Burgundian forest floor and and a bit of iodine, lots of silky sweet fruit with a briary quality. Creamy and quite thick and textural, a sweet smooth tannin quality. (2017) Delightful fragrance and florals here, a little fudge and chocolate richness, but so much creamy black fruit that finishes spicy and smooth, a ripe and spicy finish with plenty of oak in a slightly bigger, but delicious style. (2017) High, briary nose, with interesting herbaceous and floral notes, a little clove, solid fruit. The palate of this single vineyard wine has a beautiful fruit concentration and balance, the tannins, but also the roses and the exotic spice into a long, quite meaty finish. (2017) Very Burgundian, with a nice hint of the farmyard and leafy undergrowth. The palate is deliciously racy, and I love the alacrity of this with creamy polished wood and cedar adding depth, but just lovely style. (2017) Very attractive floral, peppery and lightly green aromas, with a touch of stemminess and lovely poise, medium bodied but retains that charm and medium bodied finesse and elegance, pretty but a steely core of tannin and spice. (2017) Meatier, with an earthy and dusty character, this is foot trodden and spends six months in new oak then up to two years more in older barrel. There's a sweet and fleshy plum and blackcurrant ripeness, dark and dramatic, with a subtle chocolate and cherry spice.